The bread is toasted and delicious, the filling had just enough kick to make me happy, the cheese was gooey and the paprika on the buffalo chicken was a great choice. Everything melded together into one wonderful, tasty bite each time. Basically, it's a mouth-gasm. They make every panini fresh to order so it's about a 2 minute wait for your food with no line. You get your sandwich in a brown lunchbag with hearts on it and a clothes pin (get it??) holding the top shut. Oh, and try the cookie. Seriously. Trust the nice lady and buy a cookie, you won't regret it. French dip is awesome. They used good cheese and instead of regular au jus they gave me a little bowl of french onion soup which was great. Now I'm kicking myself for not getting the specialty cookie they were pushing. 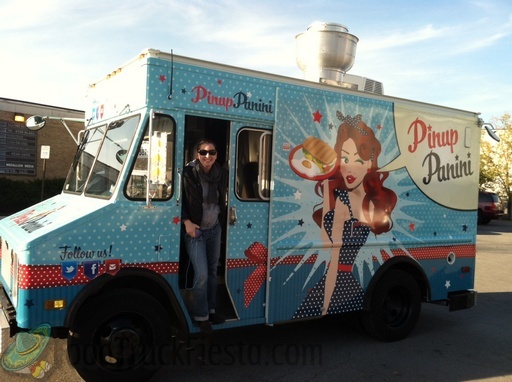 Just when I thought the DC food truck scene had jumped the shark... Pinup Panini! First off, this is one of the cutest food trucks I've ever seen rolling the streets of our fair District. The bright colors and pop may be partly due to the newness of the truck but this baby blue truck refuses to be ignored. Walking up to the window and being greeted by one of the nicer operators I've ever met, I was sold. I couldn't decide if I wanted breakfast (served all day) or lunch. The Able Grable was suggested to me and, although I was skeptical, I took it - I tend to judge recommendations more strongly than I would my own choices and figured hey, it's got bacon- how bad can it be? What I *wasn't* prepared for was how GOOD it could be! As an upstate NY native, it's hard for me to imagine a Buffalo chicken that isn't fried. Pinup's version is grilled and uses paprika to add a pleasantly warm smokiness. The bacon adds to the savoriness without distracting from the chicken, a refreshing change from the Hail Mary play that adding bacon to a dish so often can't avoid. Props to their bread, too- it has a thin yet crisp crust that provides just enough resistance to give a great bite that leads to a toothiness in the sauce-soaked crumb. I almost wish I'd gotten just another roll to snack on with dinner. 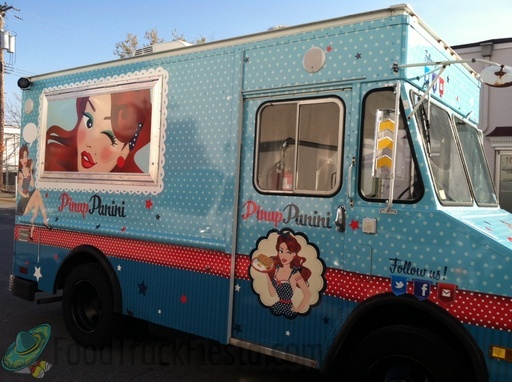 My only regret about Pinup Panini is that foodtrucks almost never come to the neighborhood I work in, so our affair will be infrequent at best. That said, I can't wait to catch them again and try the French toast breakfast sandwich. Pinup Panini offers a classic Americana menu with breakfast served all day. On April 16, 2013, they announced their retirement due to the negative political climate for DC’s food trucks.